The brightest spot on Ceres possesses a dimmer companion, which apparently lies in the same basin. There's something highly reflective on Ceres twinkling at NASA's Dawn spacecraft, and scientists hope to figure out what it is after the probe arrives at the dwarf planet later this week. 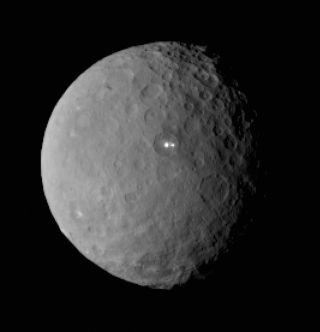 The bright-spot mystery is just one question Dawn will tackle after it enters orbit around Ceres at about 7:20 a.m. EST (1220 GMT) on Friday (March 6). About six weeks thereafter, the probe will begin the first detailed investigation of Ceres — indeed, of any dwarf planet. The two bright spots are close to each other inside a 57-mile-wide (92 kilometers) crater that sits at about 19 degrees north latitude on Ceres, which is the largest object in the main asteroid belt between Mars and Jupiter. It's possible the spots are connected with a 2014 discovery made using observations by the European Space Agency's Herschel Space Observatory, Raymond said. The telescope detected a wispy plume of water vapor in two longitude sectors, including the sector where the spots are located. A meteorite could have created the crater and melted Ceres' underlying ice layer, causing the ice to vaporize, Raymond said. "Perhaps we're seeing a deposit that was left behind, which is rich in material like salts," she said. It's also possible that the spots were caused by eruptions of ice volcanoes. But that explanation appears unlikely, Raymond added, because such activity is generally associated with a mound or crack. So far, Dawn hasn't seen any signs of these features in the area. In some ways, Ceres is more similar to the icy moons of the outer solar system, such as Jupiter's satellite Europa and the Saturn moon Enceladus, than it is to other denizens of the asteroid belt. Ceres has a relatively low density, suggesting that it still possesses volatiles (light elements such as water) picked up as it formed in the solar system's early days. Further, the dwarf planet's round shape hints at a differentiated interior, which in this case likely means a rocky core, an icy layer and then another layer of dusty deposits on top, Raymond said. Models of Ceres' formation hint that at some point in the past, it had a moderate amount of heat in its interior due to radioactivity — perhaps enough to melt water ice. Scientists are therefore on the lookout to see if Ceres has or ever had an underground ocean; cracks on the surface could be signs that material once burbled up from below. The mission team will also look for evidence of any gases seeping from the interior, which could make dust hover on the surface in the dwarf planet's low gravity. Dawn isn't the only NASA probe that will visit a dwarf planet this year. The New Horizons spacecraft will zoom past Pluto on July 14, giving researchers their first detailed views of the icy body and its five known moons. While Pluto and Ceres have different formation histories, Raymond said team members will keep their eyes open for any similarities between them. More generally, observing dwarf planets such as Ceres gives scientists a sense of how the solar system looked early in its history. It is believed that larger planets such as Earth and Jupiter gradually came together from smaller worlds — worlds that perhaps looked similar to Ceres and Vesta, the second-largest object in the asteroid belt, which Dawn orbited from July 2011 through September 2012.